College Football Predictions - Preseason Top 10 NCAA Rankings Revealed: Vegas odds makers have revealed its preseason college football predictions for which teams are most likely to win the National Championship game on January 10, 2011 at the University of Phoenix Stadium in Glendale, Arizona. What is your NCAA ranked team? Here is a look at how the top NCAA teams stacked-up. 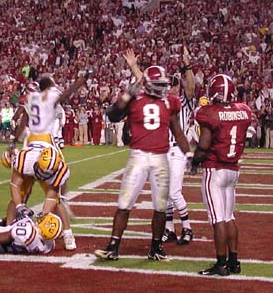 The University of Alabama, the 2010 National Champs, is the favorite college football predictions to repeat at 9-2 odds. The defending champs return their starting quarterback, a Heisman-winning running back, and the bulk of their national championship winning team. Ohio State, with 5-1 odds, is ranked second to reach the national championship game. Is Terrelle Pryor finally ready to live-up to the hype? If so, Ohio State is a good beat to meet the Crimson Tide in the championship game. The University of Florida have reloaded after losing nine starters to the NFL but feature quarterback John Brantley and a dynamic group of receivers. Coach The Gators, the third pick of these college football predictions, has 8-1 odds. Rounding out the top five are party crasher Boise State (10-1odds) and the University of Oklahoma (12-1). The next two colleges are ranked as 12-1 odds to win the game in Glendale, Arizona – TCU and the University of Texas. The Horned Frogs were the darlings of college football, finishing 12-1, and are highly ranked again thanks to an offense that returns key starters from a group that run for 238 yards per game. Colt McCoy is gone but the Texas Longhorns are still a top ten team. The University of Nebraska is next in our list of college football predictions with 15-1 odds. The Cornhuskers, who are moving to the Big Ten, but have some tricks for their old Big 12 friends with an offense that returns many weapons who scored an average of 25 points a game in 2009. The University of Oregon was overhyped a year and are 20-1 odds now. In 2010, the Ducks return 17 starters and have a Heisman dark horse in running back LaMichael James. Virginia Tech, also with 20-1 odds, possesses a dynamic offense but have questions on defense. The college football predictions season starts in just three weeks so you'll want to get your future college football predictions in now and see who winds-up with confetti in their hair come January.